New York City offices join to optimize customer service, project management and matter synchronization for law firm and corporate legal clients. This move is a testament to the tremendous growth Compliance Discovery Solutions has experienced over the past year. Compliance Discovery Solutions, an integrated eDiscovery services and managed review provider, today announced it will combine two existing New York City offices into a single, more modernized and efficient office space. The move is effective August 20, 2017. Compliance’s new address is 675 Third Avenue, 17th floor, New York, NY, 10017. Located at the corner of 42nd street and Third Avenue in Midtown, the new office will occupy the entire 17th floor and have room for nearly 200 document review attorneys. The new facility will allow Compliance to combine two offices located in New York, providing for greater efficiency and symmetry between teams. Compliance operates across the entire U.S. in order to best service its legal clients, including offices in Denver, Houston, Los Angeles, Miami, Minneapolis, Pittsburgh, Philadelphia and Washington, DC. “This move is a testament to the tremendous growth Compliance Discovery Solutions has experienced over the past year. As we continue to expand our eDiscovery services and respond to our client’s needs, our team continues to grow. Bringing our two locations together allows Compliance to offer a better customer experience to our clients while optimizing workflows for our internal teams” stated Adam Platin, Compliance’s Executive Vice President and Operating Partner. Compliance serves three primary areas across the eDiscovery spectrum, including Managed Document Review Services, eDiscovery Technology and Project Management and Managed Services, which Compliance has branded as DaaS, or Discovery-as-a-Service. Since launching DaaS, the Compliance team has taken multiple steps to expand its eDiscovery offerings. The first of these enhancements delivered DaaS 2.0, which provided multiple updates and additions to the original DaaS platform, including a number of Compliance Innovations and a client portal giving insight into infrastructure, storage, utilization, and custom metrics. In April, Compliance announced PayGo pricing. This Pay-as-you-Go pricing model provides clients with nearly the same virtual private Relativity environment as a subscription DaaS platform, but without any contracts, minimums or long-term commitments. In June, the team announced several new features including a Drag & Drop application that allows users to upload, process and begin Relativity review right from their desktop. Recent enhancements incorporate many other new features, such as automated native excel redactions, media transcription and searching, as well as a client facing archive and restore tool to better manage active and archived files. Compliance’s platform combines the power of Nuix processing, kCura’s Relativity and Brainspace’s Discovery 5 advanced analytics software. 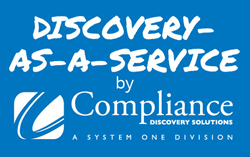 Compliance Discovery Solutions is a state-of-the-art integrated eDiscovery services and managed review provider. Through a combination of cutting edge technology, secure SSAE 16 SOC certified data centers and a national footprint of document review space, Compliance helps AmLaw 100 and Fortune 1000 clients manage critical and complex legal matters. Compliance is a System One division.